"How are my girls doing without me? The following is an email from Brook." Don't worry about the list. I am getting everything you guys need. I told Jim I needed a childs 13.5 and he said he got a pair in pink for her! The cards, you are a old person, ha ha... no your not. I don't think any old person would be able to take on what you guys are doing right now! But you are a crazy mommy, so maybe that's why you just now found them. :) The shots, don't worry, we are getting everything we need in one visit next week. I am the part-time mommy now, so I have everything under control. I do have a very funny story to tell you actually. It is going to be hard to write because so much happened, so you are going to have to use your imagination. Kind-of like when we tried to write about our dingy adventure. bird off the window seal and now it is flying around the house.... Oh, you thought the story was over huh... oh no, there's more!! Now the bird is going back and forth from the window seal to the curtain rod in the dinning room. We open all the doors and windows in the house, hoping to get the bird to fly out of one of them, and what does it do, it fly's upstairs again!! So, Sierra and I go upstairs, manage to corner it on the book case and Sierra picks it up with the gloves on and carries it outside. Oh-my-gose.... was it a crazy morning!! So, ya... Sierra was late to school, I was way flustered, both laughing, and I could only imagine what we must have looked liked!! Well mommy, I am tired and am going to go to bed. I can't wait to see you!! Love you very much and I will write again tomm. I'm sure with another crazy story!! Hi girls, it's me. I'm hoping I can send this to you both at once. Then beyond that I was hoping you two could forward this and future babbling on to the other girls in our lives that might be up all night. Or perhaps I'll post to the website. I have lost track of how many days we have been out here now. I rather like it. My calculations put us in the Marquesas in about five days. I know it sounds strange and I am, so it shouldn't, but I am not ready to leave the wide open sea yet. Some how I don't feel "purged", is that the word I want? You would be amazed at how much time passes while peering down into the dark glassy water at night trying to catch the flick of a squid in the phosphorescence, telling yourself you're waiting for something big, honestly you're happy with the squid. Hours go by as you scan the sea hoping to see a whale, but again, it's the water you want to watch. Not that I ever hold a complete thought; I do start to wonder where that swell came from or might be going. Because you have been watching the approaching storm instead of getting ready for it, you can spend an entire day finding places to hang up wet salty everything. Washing the salt water off the walls, floor, ceiling. Pumping out the bilges-you get the idea. CLOSE THE HATCHES TERI! DAH! I've done two loads of laundry-in the 2 tub, each 1' x 1', galley sink. Not bad. Drying is the problem, it's so humid it takes all day in the sun plus a night inside, possibly more, to dry a pair of shorts. I'm starting to wear less and I'm glad Greg is a creepy boy and wears his clothes too many times. The biggest problem has been the lack of snacks. We had all the chips gone before we left the dock. Two bags of pretzels made it to sea, I'm savoring the last seven. While shopping with Mom at Costco I must have been feeling healthy or afraid I wouldn't be able to poop, in the "snack" cupboard we still have: 2 and 3/4 pounds of dates, 1 1/2 bags prunes (I couldn't), 1 bag dried plums (is there a difference? ), 1 bag cranberries, 1/2 bag blueberries (very good actually), 1/2 bag mangos and a 1/2 case of Zours. What do they eat for fun on an atoll? Today, besides making an attempt to catch up on the website Log page, I took stock of our "stores"-the food we've got left. We don't have much, of the three cases plus of Kerns juices we have 5. A case of Ensure, just in case, down to 2. 10 cans of fruit, we shared the last piece of fresh fruit, an orange, with our champagne while crossing the equator. A half a head of cabbage, handful of sad green onions, 1 1/2 white onions, 2 whimpy limes and a dozen limp carrots. Many cans of assorted beans, rice, noodles, tang, oatmeal, hot chocolate, marshmallows, canned calms, tuna, canned tomatoes and we will probably be returning from our trip in three and a half years with cans of soup and mac n' cheese. One can of diet coke in the back of the frig, I told Greg I would save it for him so he could have a rum & coke when we get to the Marquesas-girls! it's so hard! I miss being able to pick up the phone, if I wanted to, and call someone-Marlene, you can now be assured I won't be calling you at 3 am. Ha! They must have phone cards in the islands, what is the time difference? I miss my daughters, I try to only think about when I'll see them again. I even miss my mom calling me. I really miss my sassy, shedding, baseboard chewing bunny. Weeb, I'm so happy he has taken over your home and you're okay with it. Thank you. Many of you know the incredible sensation of barreling along through the water on a boat in absolute blackness. You are standing watch, it is 2 am and you ask yourself for an instant, what am I watching? So many everyday tasks become small events on a moving boat. A sailboat in particular, because in addition to the random bouncing around, you have the angel of heel. Take for example making an egg salad sandwich. I couldn't find “cage free” eggs in the Mexican supermarkets, so right off I'm dealing with stressed out eggs. I've taken six-previously hard boiled-eggs out and set them on the counter—great, they now all have the pre-peel cracks. Get out a bowl, while trying to hold the six eggs in place. The bowl is too small. Get the egg flat from the frig, put the six-oops, 5 eggs in the flat. Take the bowl out of the sink. Find the sixth egg, peel that one first, it's ready. Start to mash the eggs, with your left wrist holding on to the counter, the bowl with your fingertips. Your right forearm should have a firm grip on the counter as well. I suggest using a paring size knife to cut up the eggs, damage control. When a wave knocks you free from your secure position try to grab hold of the notch in the counter with your hip. What's next: the mayo, grind the salt and pepper, the pickle-that as to be chopped too-you get the idea? When you are satisfied with what is in the bowl, go get the bread, it's in the basket across the room. I suggest taking the bowl with you. We wanted to thank all of you that contributed to our search for a new name for our boat. The original name was Titan which didn’t work for us. A huge THANK YOU! And a nice bottle of champagne goes to my dear girlfriend Jo Rawson whom gave us the name Greetings. We agreed that between the long standing open door welcome at my home and our plans to sail to ports around the world – Greetings was perfect! Many of the names were up for discussion among us for sometime. Many of the names still make us belly laugh, that’s why I’ve decided I must share them with you. So, why not just call it " Greg & Teri's latest"? or " excellent adventure"
We have 3 suggestions for the name of your new home for the next 4 years. Translation: we don’t think you require one, do you Greg? How about Weegal for Weeger plus Gallagher? You are crazy and I love it!!!! need a cook ??? " TRANQUILITY"
Well what about 'The Shack', or 'No Fixed Address', or 'Gone Fishing'. Who knows what to call it, but just call me if you need some crew at some stage during your journey. Good luck and may all the breeze be from behind you. Name it CHUCK . Easy to spell & rhymes with dirty words. I think it should be " poor Greg". :-) Does he realize what a small living space he's about to share w/ you? I forgot to ask. Does this boat come with a duck pond? Half – fast….The beat goes on…. Why knot (hahahaha) Tie the knot……Get naked! Go native… Am I helping? Since you’ll be sailing around the world, how about “ Full Circle ”? Regarding a name ….. the only thing that comes to mind ins Carpe Diem because you are seizing the day in your around the world venture. Okay, Now How Do I Get Off? ok I'll go for a few, Teri's Triumph, "G & T's, all round?" (maybe too English for you but greg & teri do =G&T) I love a good play on words. "Prozac Withdrawal", "Why Dream", "Lady Patricia", "Finally Found Bliss"
cheezy, but me. good luck! Hope you enjoyed reading through these as much as we did – and still do! 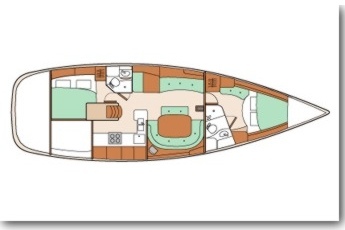 What does a 47 foot sailboat look like inside? The beds are double size, except for Sierra's, it was almost a queen. I've cut it down to just over twin size so I could make a lee cloth to secure sails and duffels aft of her bed (towards the back of the boat). Greg and I each have a drawer, as in one each, approximately 3' wide x 2' deep and 1' high. Don't fret we also have a hanging locker (poor excuse for a closet) that is about a foot wide and 4' tall. There are two heads (bathrooms) aboard, with showers. There really isn't what you would call counter space, more like a corian lip holding up the sink (birdbath). The salon (living room, dining room, study) is really wonderful! Seriously, I have never been on a sailboat with so many portlights (windows) and opening hatches as ours. The seating is very comfortable and really provides ample seating/lounging for us all. Believe it or not, me Ms anti-TV even has a flat screen! Of course it came with the boat. The salon and the cockpit (patio) are really where we will spend most of our time out of the water. Both are fantastic! The galley is big enough to whip up good things and small enough to clean in a hurry. I still need to figure out someway to secure myself to the counter when cooking underway. The white area on the starboard (right side when looking forward) aft side is what we have come to affectionately call "the garage". Like any well utilized garage it is constantly being "cleaned out and ---this is the funny part---organized." Desperately I measured and re measured, organized and shuffled but could not find room for a wash machine, not even the small combo ones. Short of taking out the generator, without which I could not use the blow dryer or microwave and the water maker, also handy to have. However, we now have a lovely tub, the soap and the dirty clothes can both be stored in it, quite convenient. I hope this has answered some of your initial questions. I look forward to sharing more of our adventure with you soon.